2015 F-150 cloth driver seat power lumbar. Some F-150s may exhibit overly aggressive driver seat lumbar support in the fully relaxed position that produces lower back pain after varying lengths of time. The lumbar function is cable-operated similar to a bicycle cable-operated brake or a bicycle cable-operated gear derailleur. When the cable is tightened, “zig-zag” style seat springs are raised providing lumbar seat support. Cable tightening in the cloth driver seat power lumbar is provided by an electric motor. Disconnect one of the lumbar cable mounting points which will fully relax the lumbar. I suspect the issue's root cause to be too short of a power lumbar cable on select seats for certain seat occupants. NOTE: This action renders the lumbar function inoperable. However, this action can be easily reversed to restore power lumbar function. 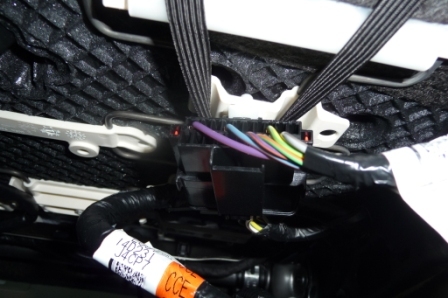 1) Underneath seat on inboard side, un-mount black seat motor wire harness connector from connector’s overhead mount and disengage elastic fabric loop holding seat cloth tight. (Photos 1 & 2) Separate by prying connector’s mount downward with a small screw driver. a. 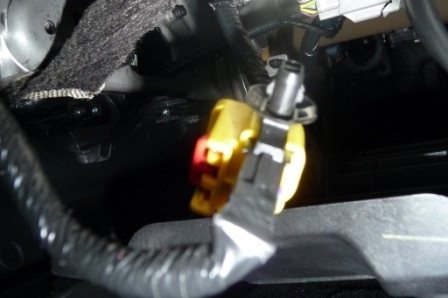 WARNING: Do not unplug seat motor electric connector which will result in an inoperable seat motor. 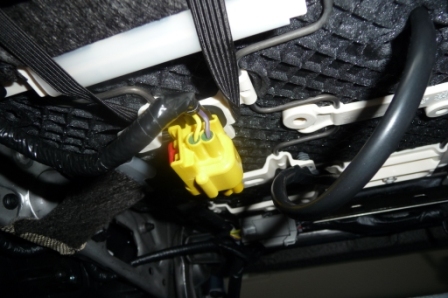 2) Underneath seat on outboard side, un-mount yellow airbag wire harness connector from connector’s overhead mount and disengage elastic fabric loop holding seat cloth tight. (Photos 3 & 4) Separate by prying connector’s mount downward with a small screw driver. a. 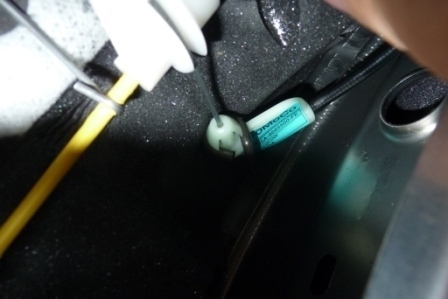 WARNING: Do not unplug air bag electric connector which will result in an inoperable seat air bag. 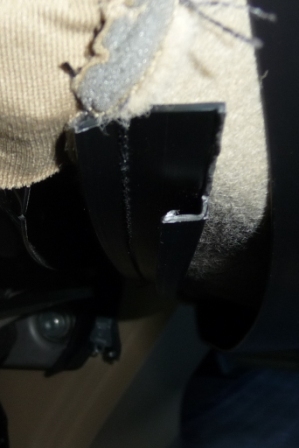 Other potential consequences when disassembling airbag systems include other catastrophic air bag failures such as accidental air bag deployment. 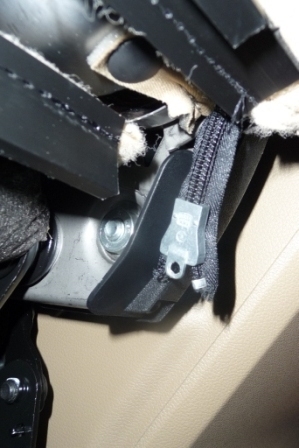 3) Separate seat cloth flexible black connectors that attach the front seat cloth to the backside seat cloth. 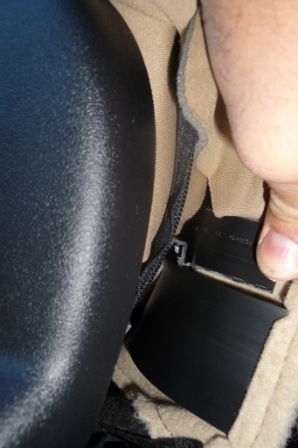 The flexible black connector runs the width of the seat and each side contains locking lips. (Photos 5 & 6) Begin separation on one edge with a medium screw driver. 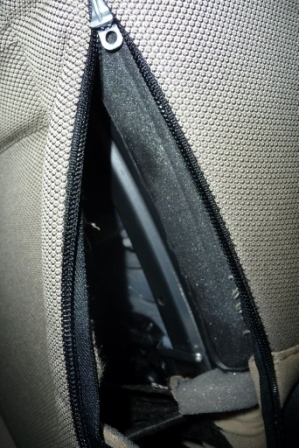 4) Unzip inboard seat cloth zipper about 6”-12” to provide access to lumbar cable mount. (Photos 7 & 8) Needle nose pliers are useful in unzipping and zipping zipper. 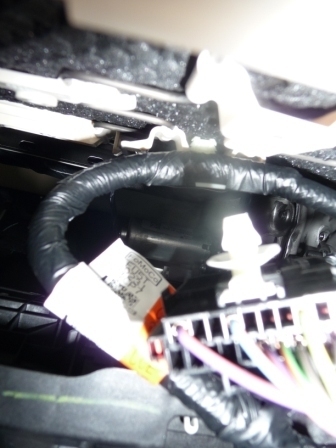 6) Disconnect and then fully separate the white plastic elbow from the black wire loop by compressing the white plastic elbow’s tabs and pushing the elbow out of the black wire loop. Last edited by ChicagoJim; 09-12-2015 at 12:06 PM. Thanks for your hard work and sharing it with us! Do you think theres a way to lower the back support and keep it working? I noticed this issue on the trucks that I test drove. I thought about that too while I was in there. If I go back in there again to modify it (probably not anytime soon as it is soooo comfortable now without lumbar ), I would take some clothes hanger wire and bend a loop on one end (like the loop in the photo) and then I would loop & connect the other end through the existing loop. Clothes hanger wire is lighter gauge (~1/2 thickness?) than what is in there, but I think it would work. IIRC, bare 8 AWG copper wire might be a good thickness match (but copper wire might be too pliable/bendable when under cable tension). Doing this would effectively "extend" the wire loop that retains the white plastic elbow thereby taking tension off the lumbar "zig-zag" springs in the relaxed lumbar setting. Then when the lumbar is activated, the lumbar cable would retract as it is designed and would tighten the "zig-zag" lumbar springs increasing the lumbar. The only downside would be that the modified maximum lumbar would be < the OEM maximum lumbar. (But if you are doing this mod, you don't want the maximum anyway). When I picked up the truck < week ago, I though it was strange (and painful) that the driver lumbar was so much greater than the passenger side in the fully relaxed position. Last edited by ChicagoJim; 09-16-2015 at 03:53 PM. This is so awesome! I noticed that I couldn't get the drivers seat to go to what I thought was a relaxed enough lumbar position on the test drives I went on but it wasn't enough to prevent me from ordering a vehicle. At least now I know there is an easy fix! I don't know. I did mine on a cloth (no massage) 10-way power XLT Driver's seat. Does this make them feel more like the 09-14 seats? Cause those, especially in a platinum, were awesome. The best way I can describe the reason why I now like (i.e., after disconnecting the lumbar cable mount) the XLT 10-way cloth bucket driver's seat is that now the seat now cradles my back and sides... it feels like a "bucket" now around my back. To reverse it, all you need to do is line-up the white plastic elbow with the wire hoop and then engage the lumbar motor... the lumbar motor will pull the white plastic elbow back into the wire hoop on its own. Last edited by ChicagoJim; 09-17-2015 at 09:46 AM.